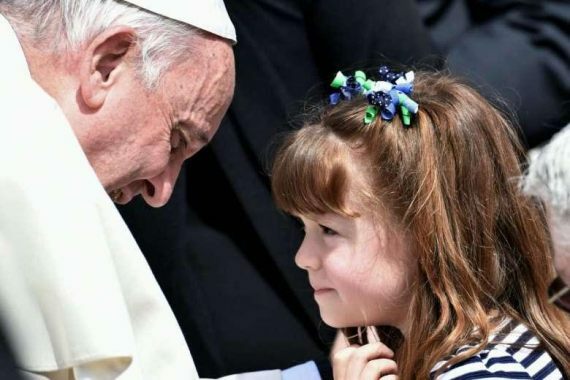 Pope Francis on Wednesday April 6 met Elizabeth “Lizzy” Myers, a five-year-old American girl who does not know she is gradually going blind from a rare genetic disease, Usher syndrome. Her parents are trying to get her to see as many things as she can, including meeting the Pope. Accompanied by her parents and her little sister, Lizzy was able to speak to the 79-year-old Pontiff in an emotionally charged encounter at his weekly general audience at St Peter’s. Pope Francis stroked the little girl’s face and gave her a rosary. “He asked us to pray for him and told us he would pray for us,” she added. Lizzy, whose case has received big media coverage in the United States, is not aware that she is suffering from Usher’s Syndrome, which will eventually leave her deaf and blind. Her parents said they would tell Lizzy, who already wears a hearing aid, about her condition gradually as she asks questions. She could be blind in about seven years so they have started what they call a “visual bucket list” of sites and people they think she should see while she can. The Myers family, from Belleville, Ohio, have spent the week in Rome taking in the city’s historic sights as part of the “bucket list”, drawn up in the knowledge that Lizzy has only limited time to see some of the wonders of the world. Lizzy gave the Pope a piece of a meteorite she was given when she was a special guest at the Warren Rupp Observatory in Mansfield, Ohio, one of the first places on her parents’ list. Her condition, Usher Syndrome Type II, means that she will gradually lose her hearing and her sight. Following publicity surrounding her diagnosis, the family was offered free flights to anywhere in the world. After reading of her case, an airline offered them round-trip tickets to anywhere in the world and the family chose Rome. They opted for Rome partly because Lizzy had been struck by Francis’s fatherly air. As well as meeting the Pope, she has this week visited the Colosseum and been treated to a VIP tour of the Italian capital’s zoo. “I feel like I have very little time to show her so much,” her father Steve Myers said.